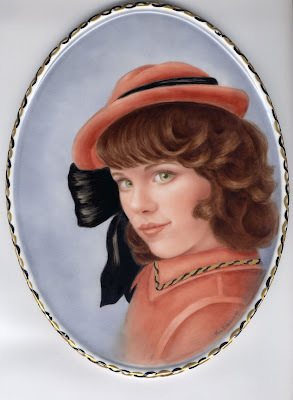 This is a portrait of my daughter Dori at 14 yrs. old. She is now married and in her 20's. She was wearing a hat that was her great-grandmothers. Growing up with an artist mom, kids just take it for granted. Dori did not think it was anything special. Her friends did think it was neat. But when I did this portrait, I noticed that she showed it to all her friends and I thought she believed it was a very good likeness. Unfortunately for my ego, I overheard her tell one of her friends, "Look, she painted my face with no zits!" Important for a 14 year old! I embellished this piece with 24 k gold and black enamel on the coat collar and around the edge of the tile.